What is rack cable management? Rack cable management covers a range of products used to manage and organise network cables within a server rack cabinet. Why do you need cable management? 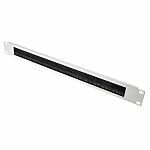 This range of 19 rack accessories prevents any cables from accidentally being unplugged or pulled out of servers and protects the integrity of your network. Sprawling cables can also be a trip hazard. Organising your cables enables you to easily and quickly make changes to existing rack servers, maintain your hardware or install new hardware. You can do all of this without having to unplug anything or navigate through tangled cables. A cable organiser, sometimes referred to as a cable manager, cable carrier or cable tidy can be horizontal or vertical. They help to bundle and route cables. This provides easy access to the cables and you can easily identify cables within the bundle. Many cable tidies feature rings that cables can be fed through, helping you to keep cabling neat. The rings can be made from plastic, metal or velcro. Cable managers offer extra support to cables, preventing strain and enhancing the lifespan of your network cables. Cables can be rested on cable trays and routed around the server cabinet. These do not normally have a ring or loop like cable managers, but are often have gaps or vents that help to prevent overheating. A cable entry panel sometimes called a cable entry seal or brush strip seal is an additional way of protecting your network hardware. Cables are run through the opening of the panel which prevents dust and dirt from entering the data cabinet with the cable. They contain a brush that removes contaminants and prevents contaminants from entering the server cabinet. Some feature an internal latch that cannot be opened without a key. This means that even if you use a cable entry seal, the integrity of a sealed cabinet is not compromised in any way. Cable management arms can be attached to the racking within your server cabinet. They provide you with enough cable slack to pull running equipment out of a 19 inch rack without the need to unplug or remove any cables. Cable management arms can help to remove the stress on cables, enhancing their lifespan. They tend to be hinged or bent to offer flexibility to be used with different racking. Some are compatible with square hole racks or round hole racks, whereas some models are suitable for both types.